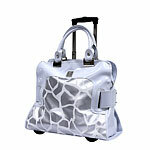 This fun and easy to carry rolling Giraffe bag is part of the “Emelia” Collection from Caribbean Joe. Multi-stage aluminum push button trolley handle system. Retracts to 13.5in and extends to 38in tall when needed. Quiet recessed inline wheels glide on sealed ball bearings. Top-zippered compartment features a padded laptop holder. Roomy main compartment is ideal for overnight travels. Full interior lining with organizer pockets. Caribbean Joe makes an imprint in your heart, and like waves upon the shore, you always come back. As perpetually modern and essential as the tide; its true value lies in the memories it holds within. Caribbean Joe represents the best of all of us – an American vision of comfort, ease and relaxation.